Something quite paradoxical is happening right now, during the Age of the Internet—an unprecedented time in our history which can be roughly compared to the invention of writing, more than 4,000 years ago, or the invention of the printing press, about 500 years ago—: people are getting dumber. With more access to information, many of us would naturally believe that education should be more accessible. The fact is that yes, there is a lot more information out there, but much of it is analogous to the trans fats that we may find in junk food. Social media is one of the mayor enablers of this pervasive diet of misinformation; and conventional media—newspaper, radio, TV, etc.—are desperately trying to get our attention with this brand of “knowledge” trying to pass as science. A positive feedback loop of misleading ideas dressed as ‘facts’ invade our senses from a lot more outlets than ever before. What I’m referring to is what has been labeled as pseudoscience (pseudo = false): Astrology instead of Astronomy; Alchemy instead of Chemistry; Conspiracy Theories (of the Illuminati kind) instead of geopolitics. This blog post will account for mayor conspiracies, factoids, pseudoscience detritus, etc., that get a lot of exposure in our contemporary media outlets. Take this post as a survival kit for the vast media wilderness that predatorily hungers for our attention. Links to the bogus factoids, as well as the actual, contradicting fact, will be posted along with each item of this list; the actual facts that aim to correct our misconceptions are known as debunkery. If any of you find another pseudo-scientific factoid, conspiracy theory, etc., be sure to write them in the comment section. 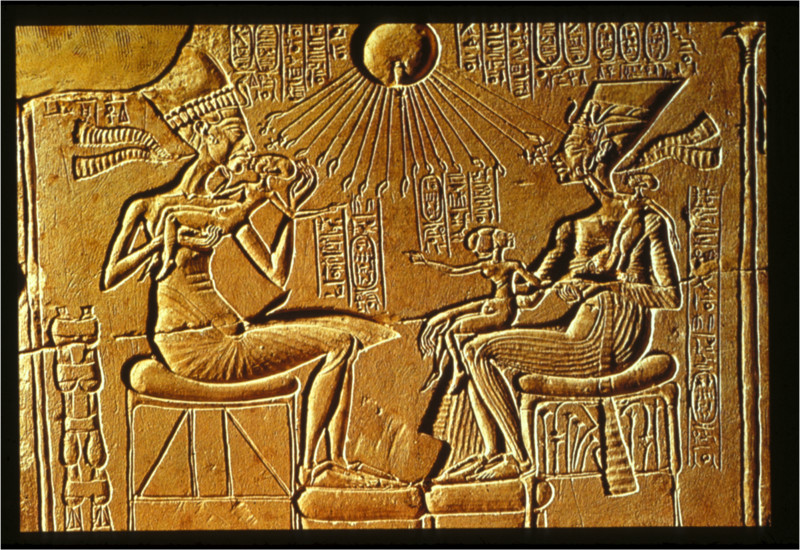 Together Akhenaten and Nefertiti transformed the religious practices of ancient Egyptian society. 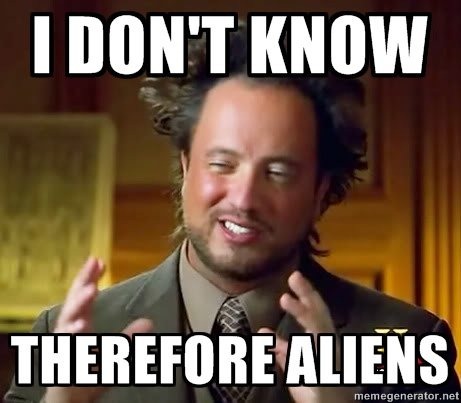 Thanks to the History Channel, this “hypothesis” has convinced a lot of people that aliens, instead of North Africans, were responsible for structures like the tombs we know as the Great Pyramids of Egypt. In fact, some ancient astronaut proponents are sure that Nefertiti, an Ancient Egyptian queen, was an alien. Debunkery: One word should be enough to debunk this outrageous and many other pseudoscientific claims, credulity, what people want to believe with little or no evidence. 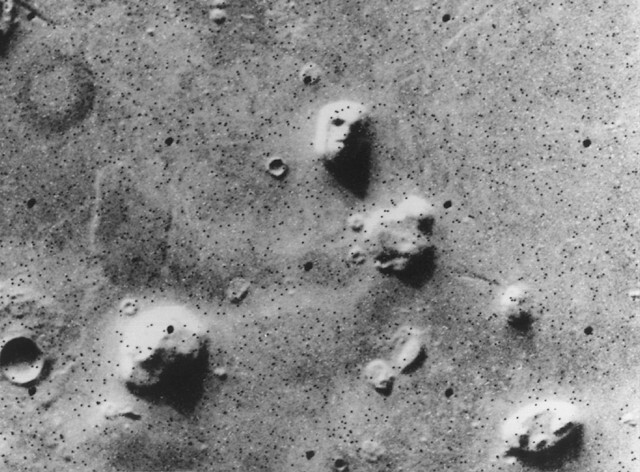 Pareidolia is a psychological phenomenon involving vague and random stimulus—image or sound—being perceived as significant. In other words, we see what we want to see. The large image on the left is a more recent one than the one at the bottom, taken in the late 70’s. 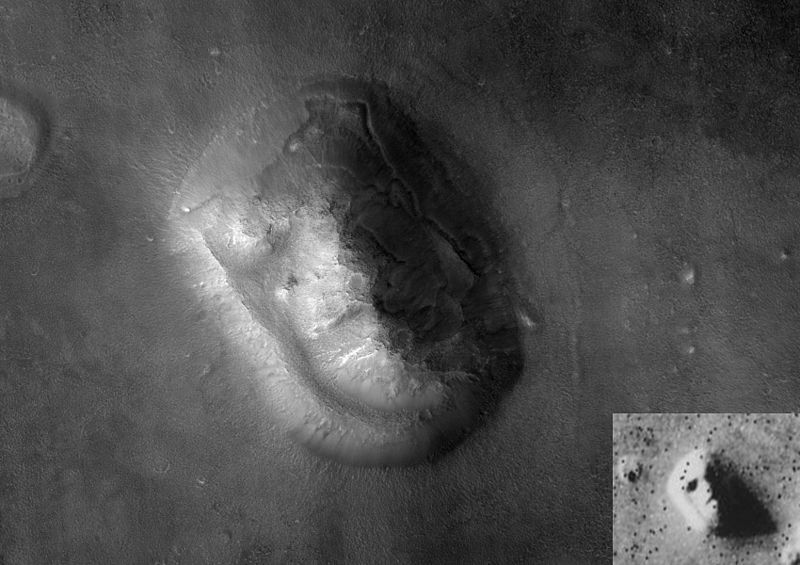 The best cure to ‘pareidolia’ is high-def. In the previous video, we see astronaut Buzz Aldrin—the second man to step on the Moon—knocking the daylight out of a conspiracy theorist that called him, among other things, a coward. I do not support violence in any shape or form, but this video shows how ugly things have gotten when it comes to the outrageous claims that many credulous people want to believe. Unfortunately, there are many more out there. They are very easy to find; and every year a new one appears. In many cases, centuries old pseudoscience digs its way out of the rubble of history to pollute the Facebook walls of millions. Mermaids, round earth deniers, “anti-vaxxers“, phrenology, astrology, etc., are among the most common—and in many cases—most ancient pseudoscientific claims that still claw their way into our ideological frameworks. The following excerpt should further equip you to distinguish between science and pseudoscience. Make your own judgements about each factoid exposed here. I encourage you to do additional research on the subject. One of my favorite subject in pseudoscience has always been that of “Intelligent Design”. Where people instead of accepting and realizing that everything that is around us, from the blood in our heart to the farthest star in our universe, has been the end result of fourteen billion years of time. In the link posted there is a well known scientist, Neil deGrasse Tyson, talking abot an argument he frequently runs into when the subject of intelligent design comes up. I am amazed. Aren’t advancements in science and technology supposed to make us understand better the world we live in? Then someone on the internet or TV goes “Hey, the facts are boring; why not shove in a bunch of aliens, ghosts, and government conspiracies which make everything 100x more fun and interesting and sell them as ‘real’?” Pseudoscience has become very popular in recent years. Common examples I’ve come across are horoscopes, 9/11 conspiracies, aliens, and end of the world prophecies. It is extremely easy to believe any of these are real. Even I have believed some of these theories (for a brief period of time), but anyone can research the facts and conclude that pseudoscience is a work of fiction. Pseudoscience can be fun when people are aware it’s not real science and is presented in a science fiction or fantasy context. It is fascinating yet saddening when pseudoscience is taken seriously, an effect worsened by the internet and TV. Pseudoscience is easily debunked, but some people don’t want to admit they’re wrong. A lot of these theories are very flawed. For example: Why would the government want to cover up what would be one of the greatest discoveries in human history? If the Earth is hollow, how does one explain volcanoes and earthquakes? I find baffling the way pseudoscience believers think, and the ideas they invent. Sometimes fiction IS stranger than fact. Conspiracy theories, spun as facts, can be as innocent as good material for scifi, or as dangerous as ideas de fan ugly emotions; such as nationalism and xenophobia. Being able to analyze media—and ask the proper questions that any scientifically literate person should ask—makes you an educated person. Learning about pseudoscience intrigued me because I’m a person that is very gullible and will believe anything that I read or hear on the media. I know most of the information is fake but I get convinced and lured in with false facts and testimonies from people and the media. One of the first conspiracies that I learned when I was young was that at the center of the Earth dinosaurs were living peacefully and were not extinct. I found this article, http://www.telegraph.co.uk/culture/books/10961412/Hollow-Earth-conspiracy-theories-the-hole-truth.html , which talked about a man who had a near death experience and was filled with copious amounts of knowledge, and was told that at the center of the Earth lived dinosaurs and tribes and a variety of wildlife, also that to enter one would have to enter through one of the poles on Earth. Debunkery tells us that it would be impossible for life to be found at the center of the Earth since at center is the inner core of the Earth which has high temperature pressure making it impossible for it to sustain life, and that’s just one of many reasons that can be found on this site, http://www.popsci.com/scitech/article/2008-06/real-center-earth . Other wacky conspiracies are made up every day, like the one about the president being a lizard, and that there are lizard people living with the dinosaurs at the center of the Earth. But one of the most heard of conspiracies of the millennium would have to be the one about the Mayans predicting the end of the world. It was said that the Mayan calendar predicted the future and that the world would end on December 21, 2012, winter solstice, ending one of the cycles in the ancient Mayan calendar. People believed that the world would end but in fact it was supposed to end in May 2003, but since the world didn’t end people changed the date to December 21, 2012. With the prediction of the end of the world other conspiracies came to light so we could understand if the doomsday was real, for example, archeologists started making hypothesis that the Mayans built spaceships and went into space to escape the upcoming doomsday, but now a days we know better than to believe conspiracies. This conspiracies also became stronger with the help of social media, like the history channel, teaching information that is just speculation without real hard facts. That’s why while we grow and are able to get more knowledge and information spread with the internet and other resources, there will be false information spreading around thanks to the media. The whole point of getting educated is to develop critical thinking. 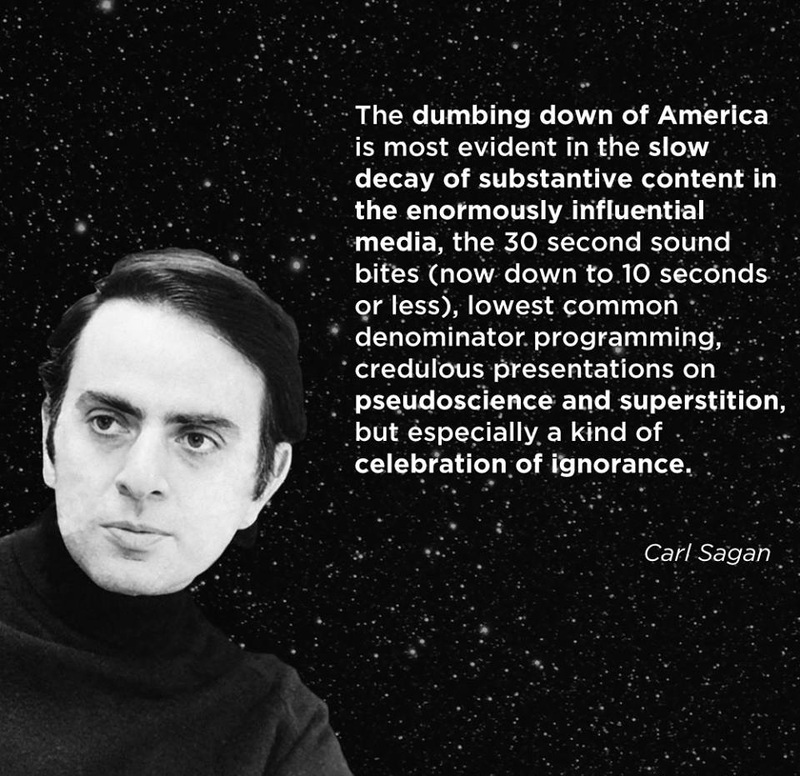 This is why concepts like ‘scientific literacy’are so important; especially during this century, which will be determined by how well we manage information. The Internet, much like any place where you can remain anonymous or not have any consequences for your actions is a large contributing factor to the growing of pseudoscience. A few of these conspiracy theories include: 2012, Ancient Astronauts, Flat Earth, etc. And most of these theories are easily debunked with a quick google search but since our society chooses to believe whatever the media throws our way without hesitation, we see a large amount of people who actually believe in these things. Any time I see a conspiracy theory I lose a little faith in humanity. I can’t believe people waste their time on such worthless things. When the conspiracy theory about 2012 first starting plaguing my Facebook wall, I was a little curious so I did a little bit of research. I remember finding all the debunks in a couple of minutes and what the year 2012 really meant in the mayan calendar. Even though the information was so easily accessible, people still chose to believe in this nonsense. The same thing happens with all the other conspiracy theories.